For the past month or so I’ve been asking myself, just what am I trying to do when I fish the Jig? Of course the ultimate goal is to catch that special fish, but that’s another story. The question is before I make the next cast, what can I do to present my jig to produce a strike? First, let’s back up a little and think about what we have going for us. We can choose a weight that sinks like a rock or glides through the water like a feather. Another great feature is the quiet way the jig enters the water. Sort of like a shrimp or finger mullet skipping across the top of the water. The jig can be fished throughout the entire water Column. This give me a tremendous advantage over most other lures and as someone said “The Jig leaves no bite behind”. Talking to a few Trout-masters here’s what they have to say when considering presentation styles. Trout like Shrimp. From early Summer to late Fall, shrimp are available. The Shrimp makes it’s living prowling the bottom, turning over sand and gravel searching for a meal. When startled, the shrimp will pop-up and dive into the sediment in a cloud of mud. Quick movements, twitches and bouncing a heavy jig along the bottom might just look like a shrimp. During cooler months shrimp disappear and Trout move on to fin-fish like the Mud Minnow. A slow rolling jig kicking up shells and falling off ledges looks a lot like a Mud Minnow rooting around the neighborhood. As Spring approaches, the water is warming and Trout are moving up in the water Column. They are working the mud flats and shorelines. 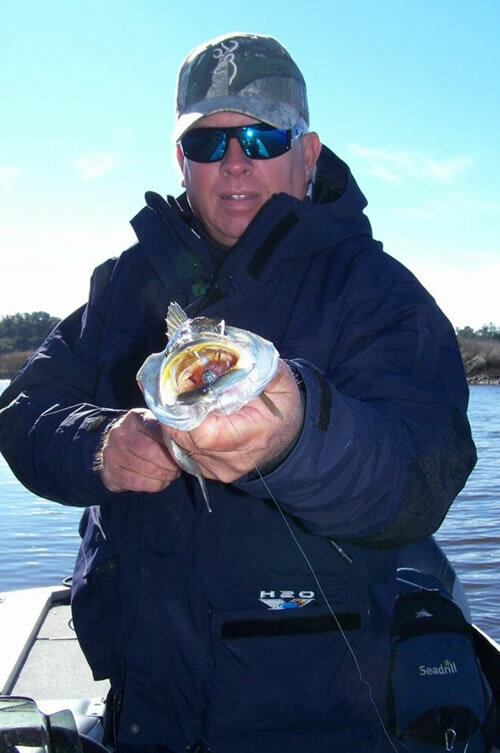 The Spawn is just around the corner and finger mullet, pogey’s, pin-fish and croakers are showing up for the party. Here’s where the lighter jig comes into play. A lighter jig with a bigger soft plastic will glide through the water like a wounded fish. If you’ve ever seen a wounded fish, it makes a little move then rests and repeats this process until it recovers and swims off. A lighter jig can produce this same action in the hands of a confident fisherman. You see, the Art of the Jig is not a specific method or question of timing. The Art of the Jig is fully adjustable. The Art of the Jig is whatever you want it to be.